Welcome to the online home of the Old Boys’ Society for Ermysted’s Grammar School in Skipton, North Yorkshire. With origins back to the late 15th Century, Ermysted’s has a long and proud history of educating boys of Skipton and the surrounding area. On this website you’ll find news about the Old Boys’ Society and our events, plus plenty of memories, photos and stories about what some of our members have gone on to do since leaving school. Have a look around the site and check out some of the archive material we’re beginning to upload. We also have a Facebook page where you can follow the latest news from Ermysted’s and some of our Old Boys. 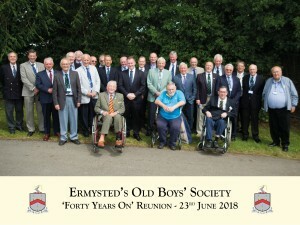 This year’s Forty Years On reunion lunch takes place on Saturday 15th June 2019. The event is for anyone who left Ermysted’s 40 years ago or more (so your final year would have been 1978-79 or earlier!). Click here to find out more and book a place at the lunch. - Support our latest fundraising efforts. - A win for the Old Boys XI against the school at cricket! - Books and Documents from the Ermysted’s Archives now available digitally. - Watch video footage from school in 1970 and 1935! Mobile/tablet users: To access the menu, tap the three lines at the top right of the page.